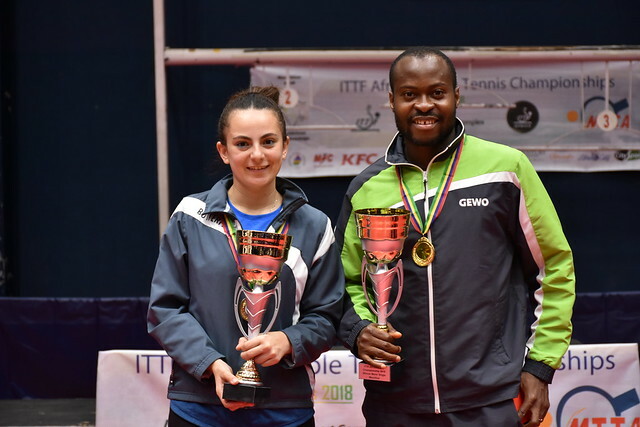 Two groups in the opening phase of proceedings in the Women’s Team event at the 2018 ITTF African Championships in Port Louis, Mauritius; at the close of play on the opening day of action, Monday 3rd September, for the outfits at the head of each group, it was a day of success. Both Egypt and Nigeria made ideal starts to their campaigns as did Algeria; all remained unbeaten. Selecting Dina Meshref, Yousra Helmy and Farah Abdel-Aziz, Egypt, the top seeds, made the best start possible; they recorded a three-nil win in opposition to South Africa’s Danisha Patel, Simeen Mookrey and Thabisile Mtshoeibe. A convincing win in their initial engagement, with Reem El-Eraky and Amira Yousry replacing Yousra Helmy and Farah Abdel-Aziz, there was no charity shown when opposing the host nation. Similarly a three-nil margin of victory was recorded against the outfit comprising Ruqayyah Kinoo, Nandeshwaree Jalim and Oumehani Hosenally. The wins meant that the Egypt ended the day the only unbeaten outfit in the group; in their concluding group stage fixture they face Angola who, on the opening day of play, selected Isabel Albino, Ruth Tavares and Jerusa Borges. In the initial contests, they experienced three-one defeats at the hands of both Mauritius and South Africa. Success for Egypt, for Nigeria it was the same but slightly different in the fact that they were required only to compete in one fixture. Represented by Offiong Edem, Olufunke Oshonaike and Funmiola Ajala, they secured a three-nil win in opposition to the Republic of Congo, who selected Cyntia Nzangani, Ammadine Litobanka and Davina Luzoto. Impressive from Nigeria; in the same group it was equally imposing from Algeria’s Sannah Lagsir, Lynda Loghraibi and Katia Kessaci. They opened their account by securing a three-nil success in opposition to the Seychelles team represented by Zahira Khattabe, Christy Bristol and Laura Sinon, before repeating the performance against Madagascar’s Harena Dimbimiarilanita, Niantsa Randrianarisoa and Rondro Rajanah. The group stage of proceedings concludes on Tuesday 4th September.